In about 4 billion years, our sun will become a red giant star, engulfing the inner planets and basking the outer planets in its ebbing heat. When the happens, according to a NASA scientist, Saturn's moon Titan, which resembles a frozen version of Earth billions of years ago, could evolve its own indigenous life. In many respects, Titan is one of the most Earth-like worlds found to date. With its thick smoggy atmosphere and organic-rich chemistry, the moon is similar to conditions on our world before life began pumping oxygen into our atmosphere. A key difference, of course, is that Titan lies outside the "habitable zone" of our solar system, which permits water to exist in a liquid state. In a recent speech delivered at the Library of Congress, Carrie Anderson, the Associate Chief at NASA's Goddard Planetary System Laboratory, explained why Titan, with some help from the sun, is even better suited for the emergence of life than the Earth was. "It's an organic soup just waiting to happen," she explains. Now these particles don't want to be by themselves; they want to get together and recombine and make a molecule. So, now the photochemistry begins. All of a sudden we start to get simple organics. We get acetylene, ethylene, ethane, hydrogen cyanide….you name it. This continues, and all of a sudden you're building up a benzene ring and other complex organics. This process continues, and you build up larger and larger ring structures, and you're making more massive particles until eventually these polymerize and you form the smog. So, basically, N2 and methane get some energy and Boom!, they start chemistry. Those organics, which deposit themselves on the surface of the moon, need liquid water to make the next leap forward. Fortunately, scientists have evidence, based on Titan's density, that most the moon's mantel is composed of water ice. When our sun swells into a red giant, pushing our solar system's habitable zone outward, that ice will melt and hello, amino acids. How long could it take life to emerge? Nobody knows for sure. Some studies suggest that life began as early as 200 million years after the formation of the Earth. Others say it was closer to 800 million years. 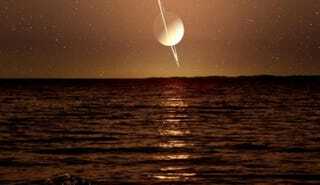 If life were to emerge on Titan, it would be confronted with a much shorter timetable. The habitable zone will continue to move outward, which means Titan has a window of around 100 million years before it's too close to the sun. When the inner habitable zone moves to Uranus (above), Titan's liquid water will likely begin to evaporate and enter the atmosphere, where it will act as a greenhouse gas that will significantly heat up the planet. Is 100 million years enough time for life to emerge? Anderson speculates this could be sufficient. Life took longer to appear on Earth, she says, because the planet spent so much time in a hot, volcanic state. By contrast, on Titan, "everything is just waiting there" for the sun's expanding radius. Just heat and set on high for 100 million years. Eventually, though, the sun is going to contract into a white dwarf—moving the habitable zone back towards Titan—and continue to burn for another billion years. If life on Titan wasn't extinguished by the Greenhouse Effect—or if the planet didn't heat up as much as expected—Anderson says "life has a real chance on Titan during those one billion years" as the sun continues to burn.